Poker - a game of chance or a game of skill? Chance, because of the random dealing of playing cards; skill as players have to make informed decisions based on the risk-reward nature of the game and the general probabilities presented with each hand. When players are placing their bets watch which chips they use. Using small denomination chips for the same size bet usually denotes weakness or a bluff while using larger denomination chips often subconsciously indicates confidence and strength. If you are betting using a black chip to bet $100 it looks like a smaller wager than a bet of $90 using three green chips and three red chips even though it's $10 more. If your opponent is inexperienced you can put more chips in the pot when you would like him to fold and the greater number of chips in the pot is more intimidating than only one and conversely if you are looking for action, bet with fewer chips. Alice Ivers, better known as "Poker Alice", moved to Colorado from England in 1860 and eventually married a mine who played cards. She often accompanied him and after he died started playing for a living. She earned the nickname "Poker Alice" having been able to make as much as $6,000 gambling on a good night. Alice claims to have won more than $250,000 gambling over the years and to have never once cheated as she new how to count cards and figure the odds and was skilled at "reading" other players while remaining stone-faced herself. 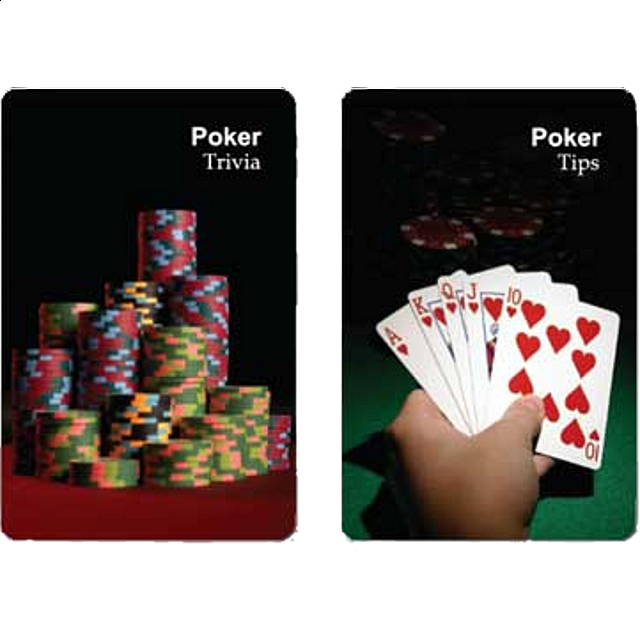 An intriguing combination of Poker Trivia and Poker Tips, while there's no guarantee you're going to win you will however learn more about the game and the interesting personalities who play for a living and for pleasure when you explore the world of poker with our Poker Tips & Trivia Playing Cards. Comes in two individual packages of 54 cards.